Bazil Leonard, Outfitter led the 2017 trail clearing initiative. The 2017 Trail Crew covered hundreds of kilometers restoring the trail network. 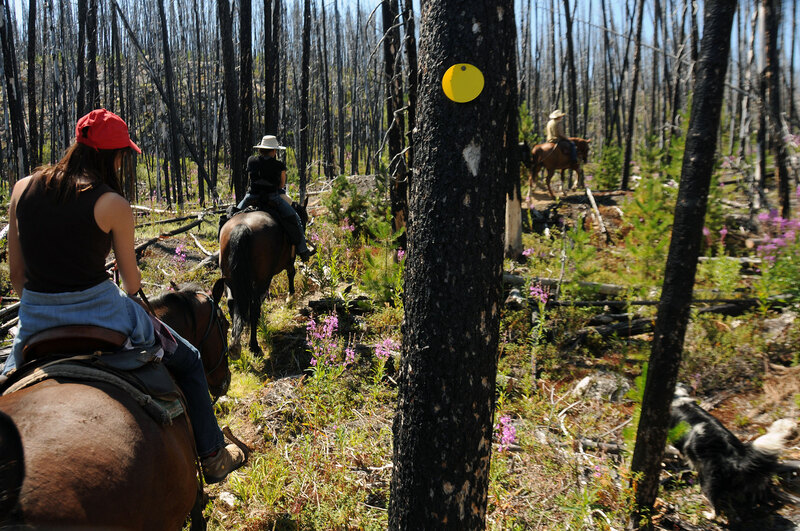 Many people don’t realize the distances that the Willmore Wilderness Trail crews need to ride on horseback, packing chainsaws, brush saws, axes and gas. Then there is the long ride back to camp on a trusty steed. 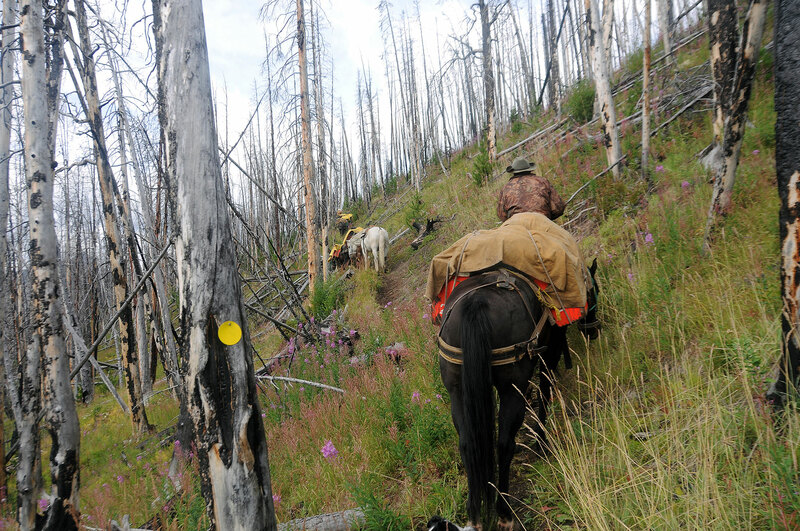 Trail crews have to deal with nature and unforgiving weather…and you always hope your horses don’t stray too far by morning. You want an early start in order to clear that extra mile, allowing you to see more pristine vistas. No matter how hard crews work, the restoration is never finished. It is a labour of love for the people who support the Willmore Wilderness Foundation, and have a passion for Willmore Wilderness Park. 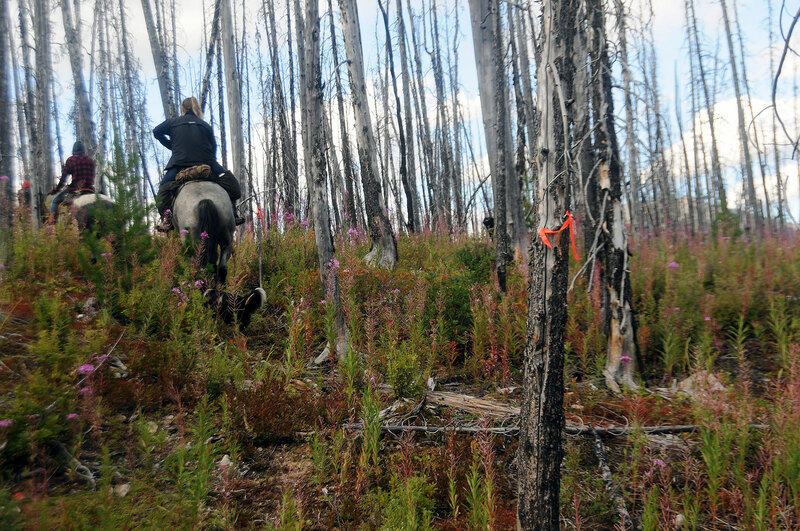 The Willmore Wilderness Foundation spent the following days clearing trail. Heavy blowdown during the winter of 2016-2017 saw a lot of trees across this trail. 12 days from Cowlick Creek to Deadman Creek. We cleared from Big Grave Flats to Monaghan Creek. This clearing kept the main artery between Grande Cache and Rock Lake open. The trail turns into a CAT trail at Deadman Creek and is open all the way to Rock Lake. We did a rough cut restoration up Whistler Creek to Whistler Lake, which was a spur trail. 18 days from the Sulphur Gates Staging Area to the Jackpine River. – Heavy cutting took place through the 2002 Smoky River burn again this year. Heavy winds and massive blowdown made the trail clearing slow. We blazed the trail with yellow plastic markers. More restoration work will be needed in 2018. 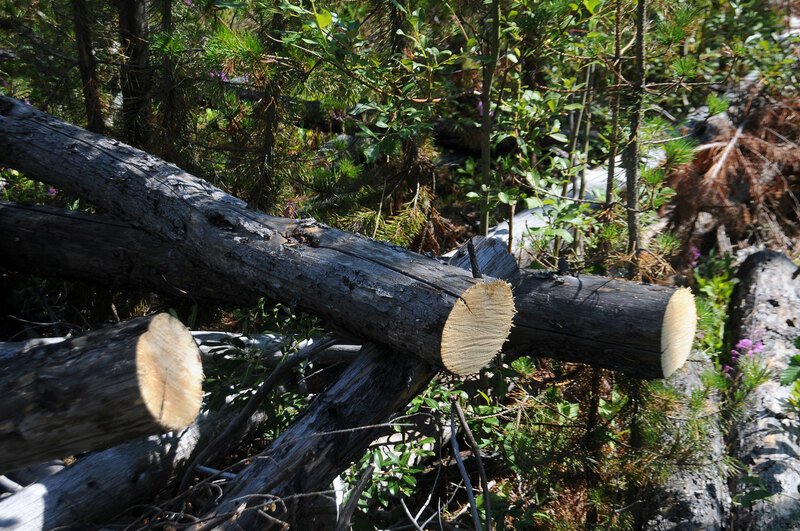 – Heavy cutting took place through the 2007 Jackpine River burn this year. 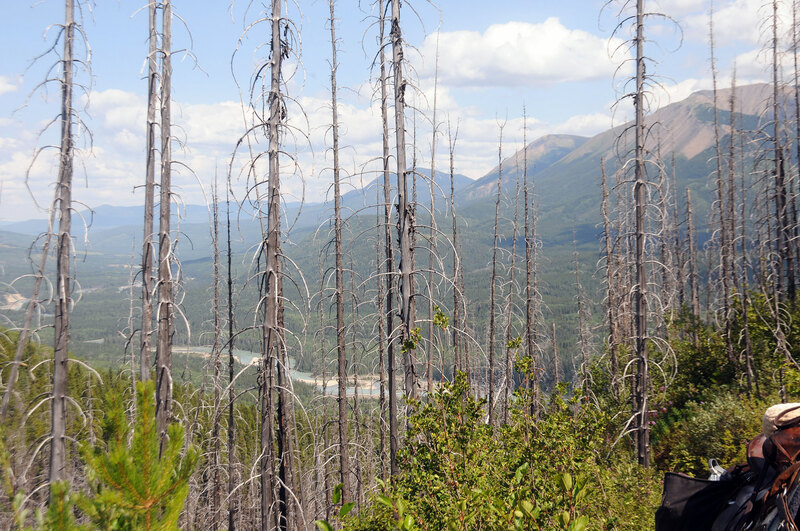 Heavy winds and massive blowdown made the trail restoration slow to Ptarmigan Lake this year. We blazed the trail with yellow plastic markers. More restoration work will be needed in 2018. We worked on the trail from Sulphur Gates Staging area to the upper Sheep Creek, down the Continental Divide and around Mt. deVeber, to the Jackpine River and back to Bazil Creek. We also worked on spur trails as can be seen on the map. 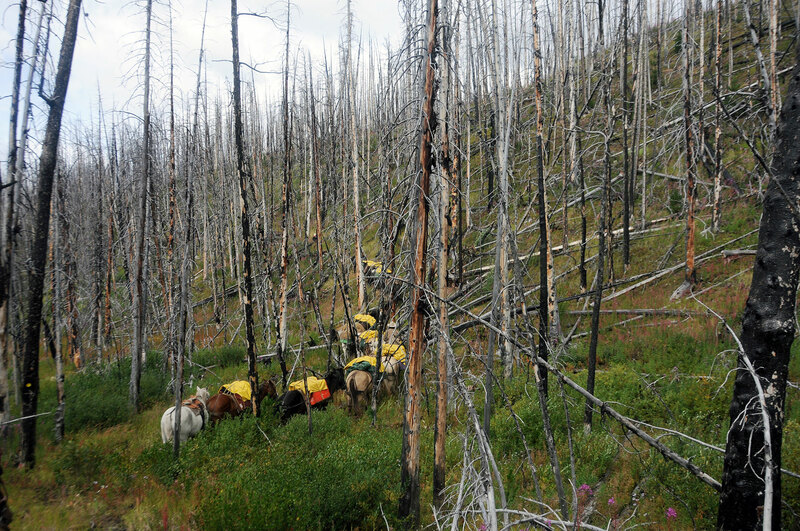 – Heavy cutting took place through the 2007 Sheep Creek burn again this year. Heavy winds and massive blowdown made the trail restoration slow to Ptarmigan Lake. We blazed the trail with yellow plastic markers. More restoration work will be needed in 2018. – There is a section of muskeg trail at the summit of the Muddy Water River and Bazil Creek that needs work. 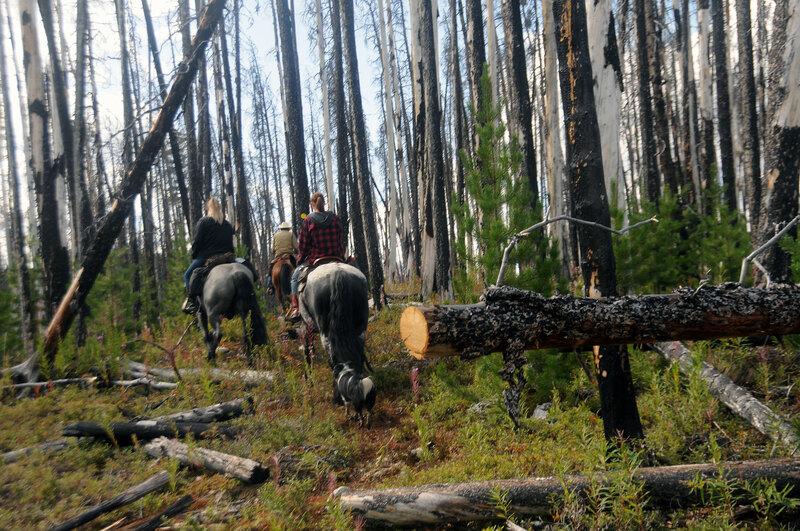 The trail along upper Bazil Creek needs to be cut out and restored. This will need to take place in 2018. – Copper Kettle Camp is named after the Hudson Bay copper kettle lid that Carolyn Hinman found on her 1915 trip with Curly Phillips. 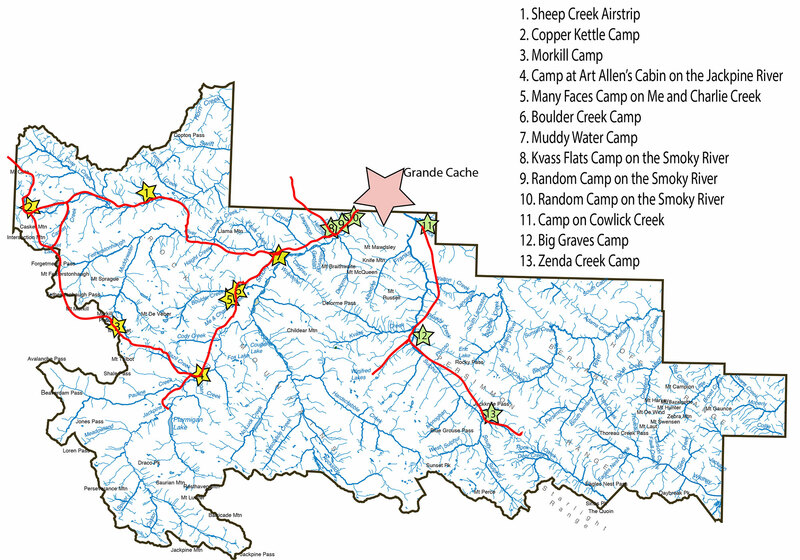 This camp is on the ledge above Sheep Creek on the trail before you go up Surprise pass. We cleared the triangle from Copper Kettle Camp located in the upper Sheep Creek Valley, up and over Casket’s east shoulder. We turned east and cut trail downstream on Casket Creek to George Hargreaves grave at the confluence of Casket Creek and Sheep Creek. The crew headed back upstream on Sheep Creek to Copper Kettle Camp. 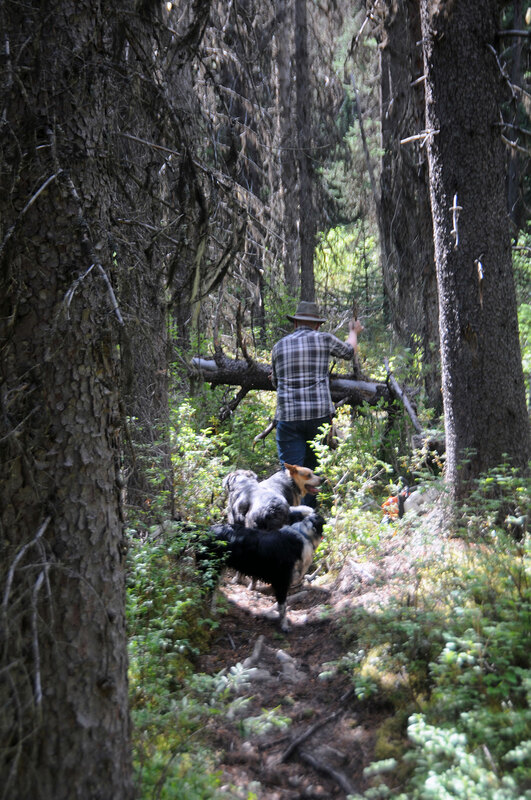 – We cleared a spur trail up Surprise Pass. Surprise Pass is named after Surprise Lake (now Cecelia Lake) that Caroline Hinman named on her 1915 journey from Mt. Robson to Mt. Sir Alexander. The trail had heavy spruce second growth that made the trail barely visible. We did some cutting and restoration work but were hampered by heavy winds and bad weather. We will need to return and work on the spur trail in 2018. 8 days restoring trails up Davey Creek to Lightning Ridge. We returned to clear the trail up and over Davey Creek to Sheep Creek. We cut trail to Lightning Ridge but were hampered by snow and bad weather. We will have to finish this project in 2018. Trail crews were out for a total of 61-days. 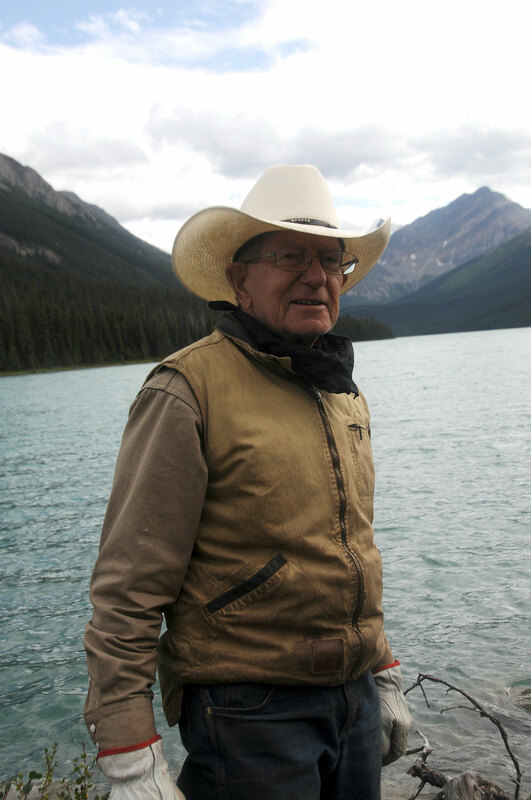 Tom Wanyandie, an 86-year-old Elder and Bazil Leonard mentored four young men in the traditional skills of the Rockies. Three young women were also mentored in outdoor cooking skills, mountain horsemanship and trail life. 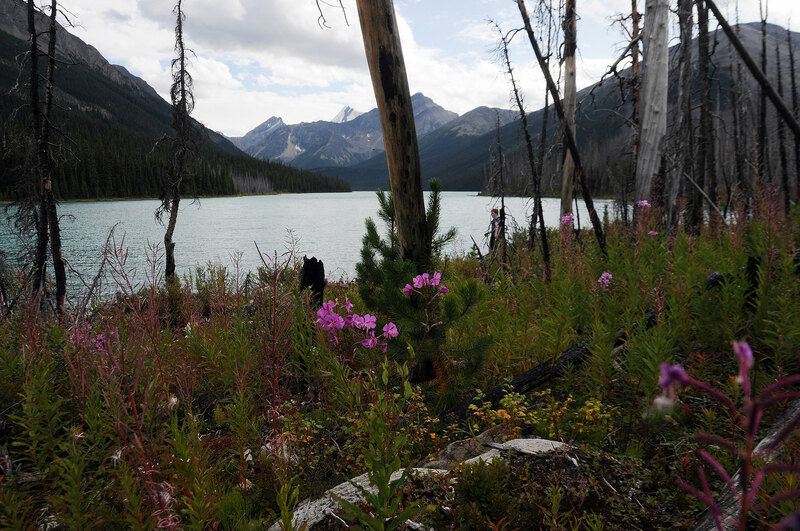 The Willmore Wilderness Foundation is focused on building capacity for future generations. A People & Peaks Production film crew were fortunate to shoot three one-hour documentaries that will be aired on Wild TV. The shows are called Spirits of the Rockies, Ghosts of the Jackpine River and Through the Mists of Time. We are using the footage to promote awareness of the traditions, culture and history of the Rocky Mountain region. Footage shot this summer will be used in social media, multimedia and tourism marketing initiatives.